I love reading books. Most of my reading is done on the tube to and from work, and before bed. I probably average one book every two weeks which is a fair amount, but won’t win any awards. I’m no speed reader as I like to really take the words in, and am yet to read an entire book in a day (unless you count my childhood love, Roald Dahl). I switch between chick lit and thrillers. Hurting Distance by Sophie Hannah, got me hooked on the latter (well worth a look!). I’m sorry to say that more recently I’ve found myself a little bored of classic girl meets boy stories and have been reading more of the heavy stuff. You’ll see that my blog tag-line includes ‘novels’ and bearing in mind my love of books, a friend asked last week why I haven’t mentioned any on here yet. I replied that I only want to write about a book if I’d actually recommend it. Well, you’re in luck because I just finished one that I love and can recommend whole heartedly. 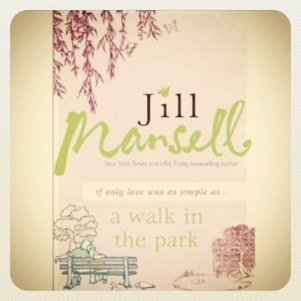 A walk in the park by Jill Mansell has likeable characters, twists and turns and it’s fluffy, but not over kill. I absolutely loved it. Rather than give away any spoilers I’ll let you wonder over to Amazon for more info if you fancy the sound of it. It’s her latest book and if you like it there’s plenty of her others to catch up on. Just wondering if you would be interested in doing a profile or interview of me and my chick lit novel, Entice Me on your blog? I have lots of inspiring comments to motivate writers and readers and would love to have the chance to connect with your followers. Thanks for checking out my blog. I certainly would be interested! I’ll drop you an email.